Phony. Whiner. Loner. Standoffish. Golf diva. 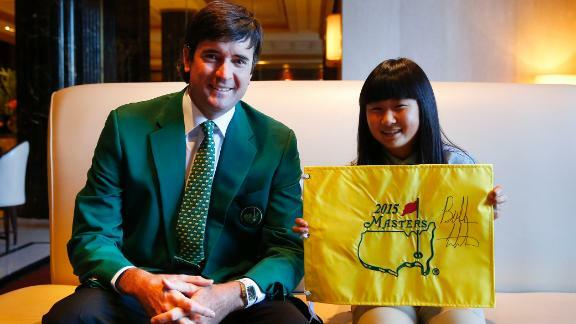 Am I missing any of the popular criticisms of our two-time Masters winner, Bubba Watson? Bubba might be the people's champion, as well as the Masters defending champion, but I'm not sure he's beloved by his peers. In an ESPN.com poll of 103 players, this hypothetical was posed: " ____ ___ is in a fight in the parking lot. I'm not helping him." Watson was the runaway winner of sorts, doubling up the number of responses (22.6 percent) for second-place finisher Patrick Reed (11 percent). Rory Sabbatini came in third. Robert Allenby came in fourth. And the people who conduct the Tour's urine tests on players came in fifth (just kidding). OK, a few things about the hypothetical: Tour players don't generally get in parking lot fights. And if they did, I'd take the other guy -- unless they were tangling with Ernie Els, Gary Woodland, Dustin Johnson, Angel Cabrera, Lee Westwood and Miguel Angel Jimenez's ponytail. In recent years, there has been a bubbling undercurrent of Bubba backlash among some players and even among some members of the media. Two other words you sometimes hear related to him: schtick and disingenuous. Anyway, Watson got the most votes. It wasn't exactly a landslide, but it was interesting that he finished first. Interesting and a bit unfair. Watson isn't like you and me. He isn't like anybody, really. He can be charming or grating, lovable or unbearable, tearful or terrible. He has his flaws, which is why Watson has a long history of issuing apologies on multiple continents. Remember his Ugly American incident in 2011 at the French Open, when he managed to insult an entire country? Or when he moaned about the course setup at Olympic Club during the 2012 U.S. Open? Or mocked the waste areas at Pinehurst during the 2014 U.S. Open? Remember when he stiffed the just-for-fun long-drive contest at last year's PGA Championship, the same tournament in which Watson moaned about the rain-soaked conditions -- to the point that he stood under cover while his caddie Ted Scott teed up the ball for him? This is the same Scott who once threatened to quit if Watson didn't clean up his bad-attitude act. Watson is No. 3 in the world rankings and No. 1 in mea culpas. He sometimes speaks and then thinks. He acts and then waits for the consequences to catch up -- which they always do. On occasion, it's as if the 36-year-old Watson is stuck in the terrible twos. He can throw tantrums one minute and then disarm you with a child's innocence the next. He can be a breath of fresh air or a bunch of hot air. There is no in between with Bubba. Watson adores his wife, his Waffle House and his two kids. He's crazy about his mom, assorted charities and he has totally bought into Augusta National's Drive, Chip and Putt initiative. But I can see how he could wear people out. I also see a good heart and a sometimes clumsy social way about him. Can he be a bit of a hick, a goof? Do you sometimes wonder if his visor is impeding blood flow to his brain? Yes ... and yes. But I've seen him talk about the joys of being a father and watched as his tears of pride unashamedly flowed. I've seen him at North Berwick Golf Course in Scotland, where he had a smile as wide as the fairways as he played a goof-around 18 holes with his buddies. I've heard him gush with excitement as he explained why the third round of the 2008 U.S. Open was the most fun he has ever had watching a tournament on TV (he had bet his wife that Tiger Woods would eagle the par-5 13th hole at Torrey Pines, birdie the par-4 17th and eagle the par-5 18th to move into first place -- and Woods did exactly that). And yes, I've seen and heard Watson do dumb things, but he almost always publicly acknowledges his dumbness. It's as much a Bubba tradition as his pink driver. Watson isn't polished and never will be. He is a burrito-eating contrarian, and his eccentricities don't always translate well. He thinks and plays outside the box -- and that unsettles some people. And to those players who would let Watson get walloped in a parking lot, who simply don't know what to make of him, I'd say "Deal with it." So what if about 23 percent of the player respondents aren't crazy about him? So what if he's unconventional and unpredictable? That unpredictability (will you get Good Bubba or Bad Bubba?) might make him insufferable at times, but it also has something to do with him winning two green jackets. Nick Faldo wasn't everybody's particular brand of vodka, but he didn't seem to care. Woods plays to win majors, not popularity contests. Reed would prefer that you like him, but it isn't mandatory. He's going to try to beat you with or without your friendship. Watson still has some work to do on his manners. He can annoy you, make you roll your eyes in exasperation. One more peep from him about a U.S. Open setup and someone is going to run him over with the General Lee. So he's not perfect. Not even close. But he's the only guy in the Masters field who can go back-to-back on green jackets. And if you posed another hypothetical to those same players -- Would you trade places with Watson this week? -- I can already tell you the voting results.